Bots have finally made their way to Facebook. The bots have arrived. At least, the Facebook bots have arrived. Earlier this week, the social network announced that it believes that chatbots could one day replace 1-800 numbers and become a primary method of providing customer service, thanks to a mix of artificial intelligence and human intervention. While the demonstration at the Facebook Developer Conferences was mostly focused on commerce, the bot platform can also be used for media, allowing publishers to reach out to subscribers directly and give them access to news and other services. Take Hi Poncho, for example. This is a cat bot that tells you the weather. Things are, generally speaking, okay. However, it is not exactly the most efficient way to get the weather. But I just said…did you even listen to me? And then it harassed me about whether or not it could send me updates. 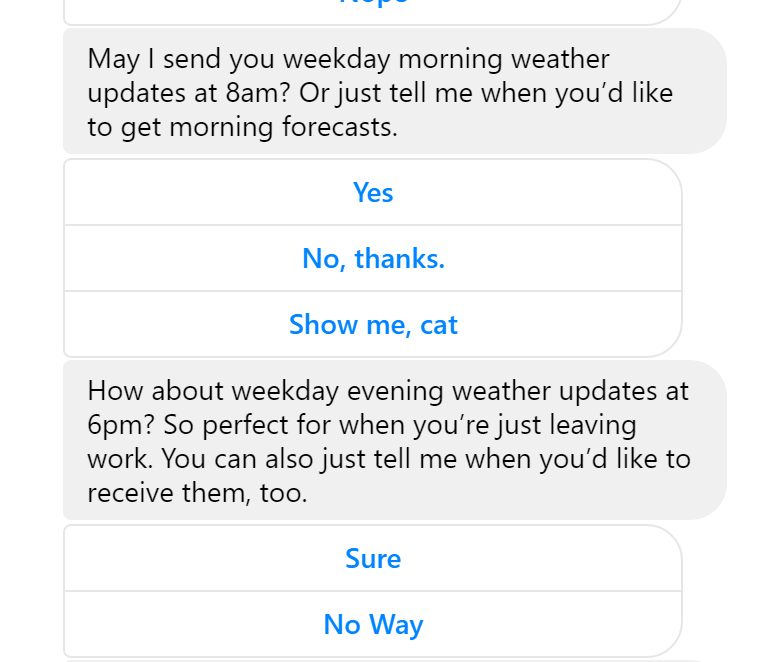 Pro tip: If you click “No, thanks,” it asks to send the updates at another time, and then it asks you about sending you catnip or something, which is cute, but maybe not the best way to get the weather. So, it seems that (some of the bots, at least) have a ways to go. And keep in mind that the bot platform isn’t a new concept. To date, bot stores are available for Telegram as well as Kik, and AOL had bots on their instant messenger years ago—the difference lies in the volume of users who already use Facebook messenger. There are 900 million people who use Messenger every month, which already puts it way ahead of its competitors. 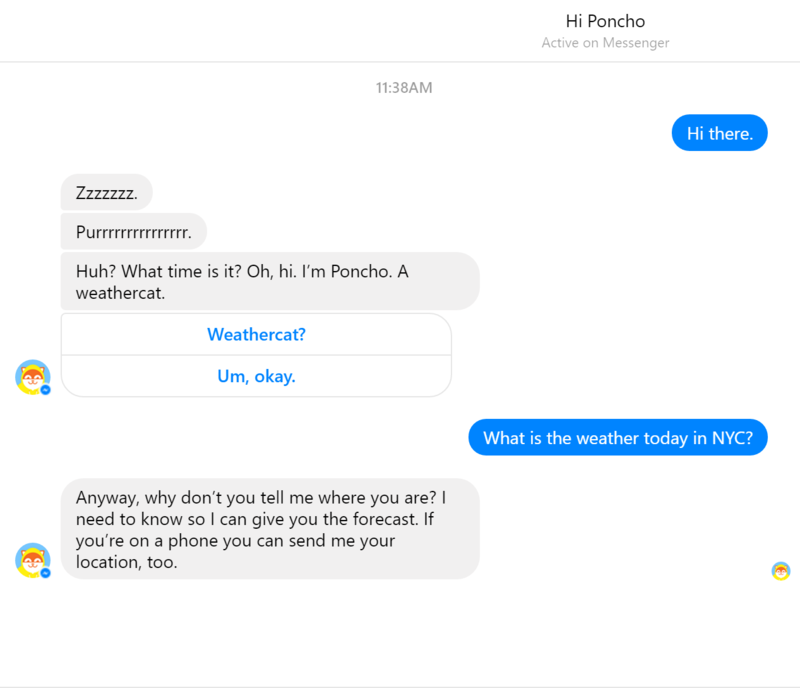 This could mean that, while the technology may have been introduced by competitors, a customer’s first chatbot experience may be with Facebook’s Messenger…and sadly, it won’t be a great one. Microsoft is already set to launch its own bot platform as well, as well as messaging app Slack, who is reportedly dedicated $80 million to fund the development of bots.